I'm just listening to the radio where Tim Fookes compares giving plastic baby toys to children with watching a man getting run over on TV. When did unborn human babies become offensive? Parents are outraged after an anti-abortion stall gave their children plastic foetuses at an A and P show. On Thursday, anti-abortion groups teamed up to exhibit at the the Canterbury A and P Show on a Voice for Life and ProLife stall. Amber Murdoch said her son, 11, arrived home on Thursday with a model foetus after a school outing. "I was shown it at 6 o'clock at night when I got home from work," Murdoch said. "It led to me having a really uncomfortable conversation when I had to explain to him he wasn't actually going to be allowed to play with this thing, and having to explain what abortion was all about." Murdoch said her son also received a leaflet written for women who were pregnant. Murdoch said she would ask Canterbury A&P Association to investigate the stall and would lodge a complaint with the Advertising Standards Authority. Avril Thresh said she saw young boys running around with the foetuses. "Regardless of whether you support their beliefs or not, we don't feel it's an appropriate platform for them to be spreading their message." At least the kids weren't handed small plastic body parts, simulating how abortion rips apart babies, in a plastic bag filled with red goo. Now that I could see would be distressing, but a small plastic baby? You've got to be kidding. It's as if people are far more comfortable with assuming that preganacies don't actually involve babies, that they are someone magicked into existence at birth. Do these people tell their children that the stork brought them and they were found in the cabbage patch? Is the reality that every person was once an unborn baby just too much for them? It just boggles the mind. But Voice for Life President Bernard Moran says the dolls are prizes in a game used to educate people about foetal development. "We don't give them away. Only if you win the competition. "We don't hand them out as an anti-abortion thing. 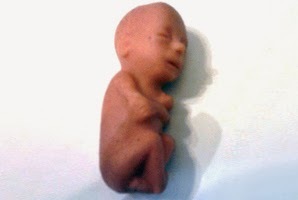 They represent what a little baby looks like." Bernard Moran is surprised by the complaints and says parents usually like the dolls. "This is the first time we've actually had complaints." I wonder if the woman who complained has had an abortion herself and that's why she found the dolls offensive, as the reaction of most parents above seems far more normal to me.